Chokecherries: Are You Ignoring an Important Fruit in Your Backyard? For years I've passed by trees that hung low with red to black fruits. I honestly had no clue what they were, so I figured they were poisonous. The reality is that they're anything but poisonous. 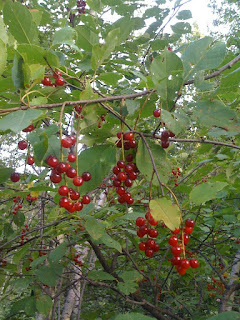 I discovered that they were chokecherries and black cherries that are amazing when made into jams and other foods. I've heard about chokecherries for years. Back East, chokecherries were something someone else used. The name implied that eating them were nasty. Despite the name, they are amazing little berries. The only part of the chokecherry that is safe to eat is the fruit. The seeds, leaves, bark, roots, and twigs carry a toxin called Hydrocyanic acid (HCN) or Prussic acid. Prussic acid become cyanide when consumed -- definitely toxic and potentially deadly. The good news is that the fruit is awesome and perfectly safe. The common way people used them in the past was dried. I'm not sure if the cyanide leaves the seeds when they're heated or dried,** but Native Americans pounded them into a powder and used them as a flour. It was such a ubiquitous berry and so often used that both the Blackfoot and the Cheyenne simply called it "the berry." That's hard to argue with, really. 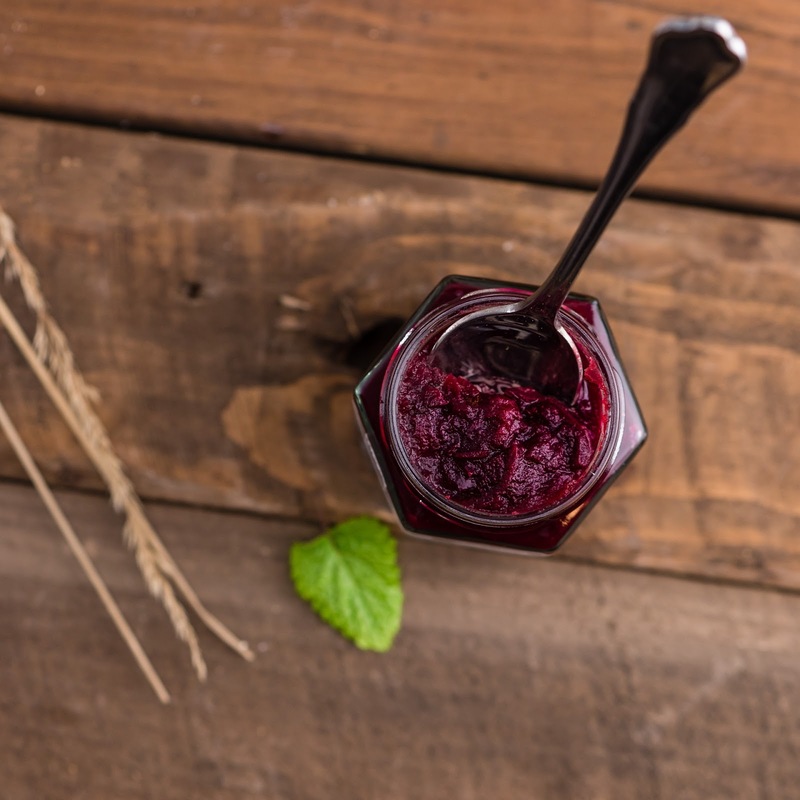 I do know that the berries are totally safe to consume especially when cooked in jams, jellies, or in wine. Chokecherries are amazingly versatile berries that you can use in just about anything. I've made chokecherry syrup, chokecherry jam, and chokecherry "soda pop." Chokecherries have an amazing flavor when cooked. Raw, they can be anything from mildly sweet to pucker-your-face tart. They're high in Vitamin K, B6 and other B Vitamins. They're also high in fiber. Because they grow across the US and Canada, it's hard to imagine a food resource that is as useful, or as free. Chokecherries grow in the northern parts of the United States and through the mountain ranges such as the Appalachians and the Rockies. It grows in the western part of the US all the way down to Colorado and Kansas. I've seen them grow in disturbed soil, in drainage areas, and near creeks. They tend to like sunny areas, so you won't find them in dark timber. Chokecherries are easy to recognize, but there are imposters out there that are poisonous. The chokecherry imposter is the common buckthorn, which is also an invasive tree. Buckthorns have a thorn at the end of the branch (hence the name), and have leaves which are smooth and are in opposing pairs (each leaf stem is directly opposite of another on the branch.) Chokecherries and black cherries have thinner leaves with serrated edges. Their leaves grow in an alternate pattern. Furthermore, if you pick some fruits and mash them, it will become more apparent whether you have a chokecherry or a buckthorn. Chokecherries have one pit per fruit and look like cherry pits. 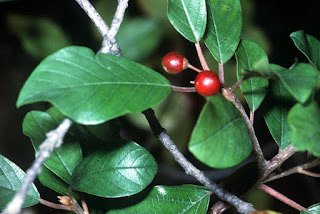 Buckthorns have 2-4 seeds within their fruit, thus identifying them immediately. If you are still uncertain or cannot tell the difference between the two, do not eat the fruit. Instead, have an expert identify your chokecherries for you because buckthorns are very toxic. 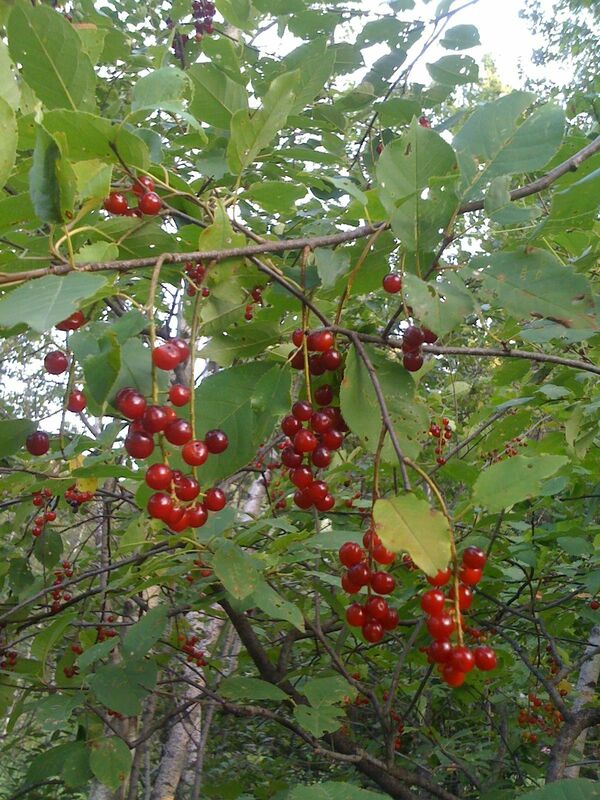 Here are some good guides for identifying chokecherries: How to Identify Wild Chokecherries, and this guide from the Iowa State University County Extension. Chokecherries are ripe when they turn deep red to black. Different species will dictate which color the berries will turn. When in doubt, talk to your county extension office. As I've said, I've made various chokecherry products including chokecherry jam, chokecherry syrup, and chokecherry soda. 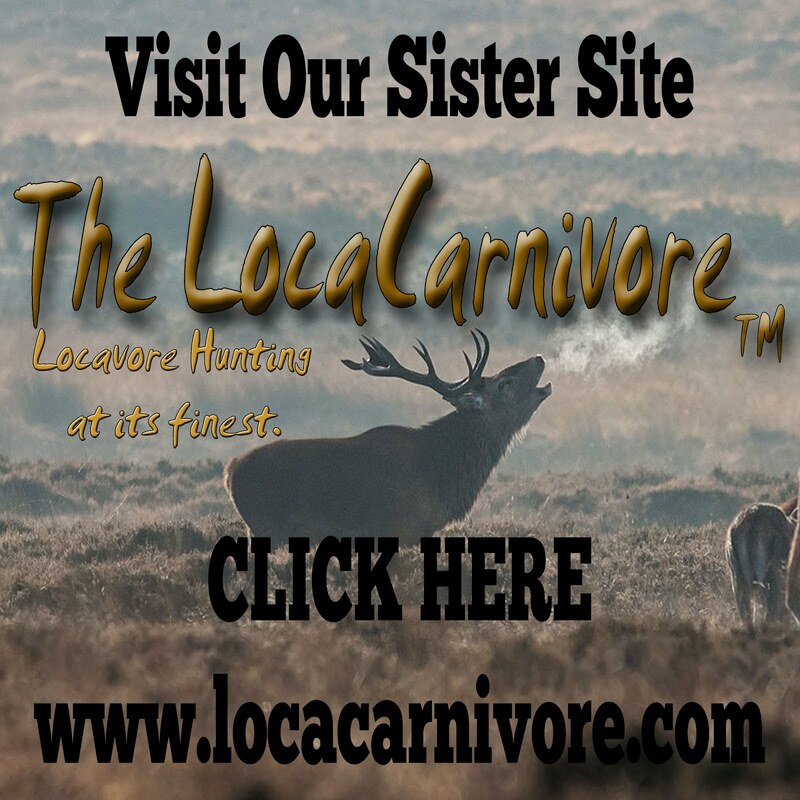 Here are some excellent recipes for you to try from the Montana Fish Wildlife and Parks and from Mother Earth News. Let me know if you have any recipes you've found that are particularly wonderful. ** I spoke to my sister who had been a toxicologist nurse for the Rocky Mountain Poison Control Center and had her look up the cyanide in chokecherries. She looked through what is apparently the definitive text for toxicology and told me that it appears that heating does not destroy the organic cyanide compounds within the seed, so drying or cooking them does NOT make them safe. If you have better knowledge than that, please feel free to come forward and educate me.